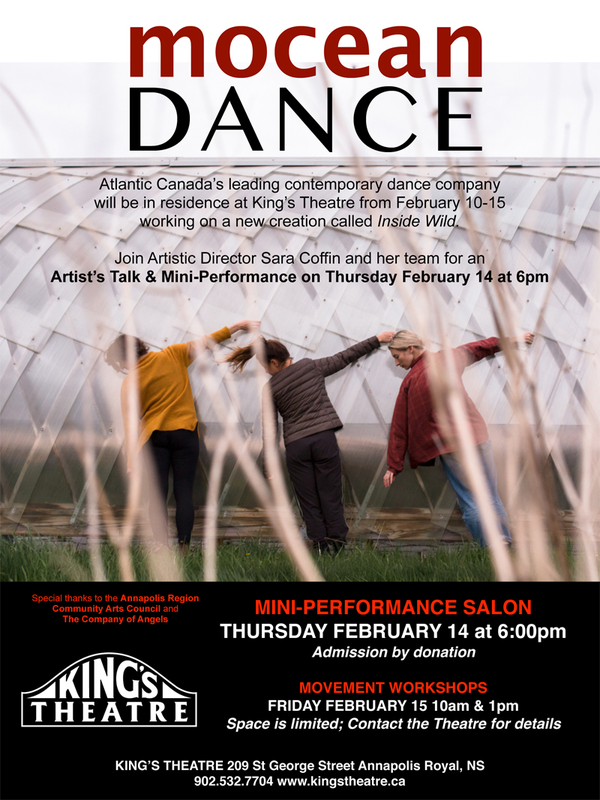 Halifax-based contemporary Dance Company MOCEAN DANCE will be in residence at King’s Theatre from February 10-15, creating a new work. King’s Theatre is pleased to announce the creation residency of Atlantic Canada’s leading contemporary dance company, Mocean Dance from February 10-15, 2019. During this time, Mocean’s Co-Artistic Director Sara Coffin will work on a new creation, Inside Wild, while experimenting with new multimedia elements and set design possibilities for the new, original work. Joining Sara are dance artists Anastasia Weibe, Julie Robert, Lydia Zimmer & Georgia Skinner as well as collaborators multimedia artist Nick Bottomly & composer/multidisciplinary artist Brian Riley as they experiment with multimedia elements and set design for the new work. King’s Theatre patrons are invited to join some of Nova Scotia’s most innovative dance and theatre artists for a work-in-progress sharing for an intimate behind-the-scenes look at how contemporary dance is made along with an artist talk that will explore the working progress when incorporating multimedia elements to help tell a story.